Check Cebu Pacific promo fares as low as P499 base fare for trips until the 3rd quarter of 2018! 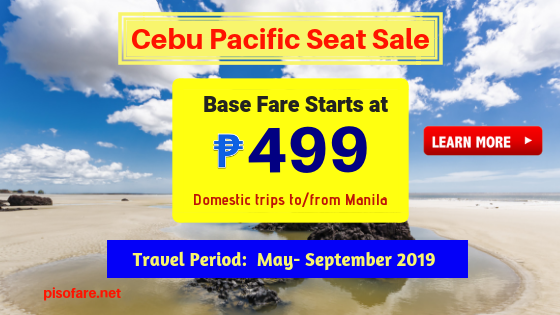 Avail as low as P499 base fare via Cebu Pacific domestic seat sale for travel dates May 8 to September 30, 2019. Thus, you have 5 months to choose from where to go using Cebu Pacific promo tickets. Cebu Pacific sale tickets are base fare promos to or from Manila including flights to Coron, Siargao or Batanes. As for international promos, sale ticket available for Clark to Narita flights from August 9 to October 26, 2019. Cebu Pacific sale tickets are limited! Book ASAP! Cebu Pacific Promos: How to Avail? Booking ticket online is the fastest way of getting Cebu Pacific promo tickets. Book at www.cebupacificair.com without inputting a Promo Code. Book and buy the low fares at Cebu Pacific sales and ticket offices in Manila, Luzon, Visayas or Mindanao. Contact Cebu Pacific Reservation Hotline Numbers in the Philippines and other countries. Great for one-way trip, Cebu Pacific sale ticket rates are base fare promo and thus, cover only the fare and 7 kilos hand carry baggage. In case you are bringing heavy luggage or several bag, you can save on checked baggage fees by purchasing Prepaid Baggage Allowance during booking or up to 4 hours prior to scheduled flight departure. Read Cebu Pacific Baggage Fees: Domestic or International for more info. Be updated on airline promos and seat sale! Like us in Facebook: PISO FARE TICKET!